Without any prior announcement, Anonymous Serbia today started contributing to a global operation against ISIS. Today Iraq is descending into chaos yet again, thanks to the ruthless gang aiming to establish an “Islamic” state covering both Iraq and Syria, thus doing away with the post-WWI borders. They call themselves ISIS. These savages, who have no religion or morality, are bent on burning everything in their path, killing and pillaging as they go. “Browsing facebook randomly, we found a few pages which openly call for the formation of the Sandzak army and consequently advocate for the secession of the territory from Serbia. Also, they all have clear mujaheddin features. What we did was to respond to this cyber-threat, by identifying and exposing some of the group leaders”. 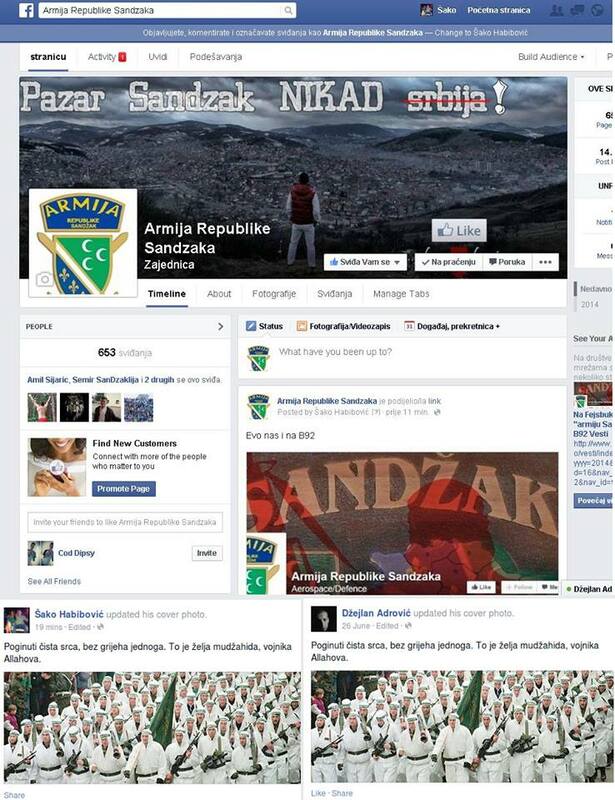 Sandzak “army” leaders are identified by Anonymous Serbia. The fun part of this little op was that this action, which was done publicly and involved lots of people, caught the attention of the Serbian Cyber-crime unit. Prosecutor for Cyber-crime in Serbia, after doxing was over, stated that they were ‘prepared to respond anyway’, and that Serbian police is ‘already working on identification of group leaders’. Sandzak “army” leaders identified by Anonymous Serbia. The fun part of this little op was that this action, which was done publicly and involved lots of people, caught the attention of the Serbian Cyber-crime unit. Prosecutor for Cyber-crime in Serbia, after doxing was over, stated that they were ‘prepared to respond anyway’, and that Serbian police is ‘already working on identification of group leaders’. ISIS threat in the Balkans? In June the internet was flooded with series of notes expressing support for Islamist Jihadists. During the campaign #AllEyesonISIS it was clear that this warmongering, terrorizing group has significant support in the region of Western Balkans – Kosovo, Sandzak, and Bosnia and Herzegovina. Two out of three Balkan regions, from where support to ISIS was sent out to the internet, are either historically or administratively part of Republic of Serbia, while Bosnia is a neighboring country. Event that triggered the attention of Anonymous Serbia took place on September, 5th. It was military-styled parade that stirred the public. The group of about thirty men in green uniforms with red fezzes, and green berets on their heads, occupied the central streets of the city of Novi Pazar, in Sandzak (Serbia). They marched from HQ of Islamist community to main city square, in their “foray into Hadžet” (village of Novi Pazar). This parade caused mostly negative comments of prominent individuals in the city of Novi Pazar and surrounding area, because of uniforms resembled those of war criminals who took part in the extermination of Serbs during the WWII. The parade was lead by Islamist Chief mufti and his associates.